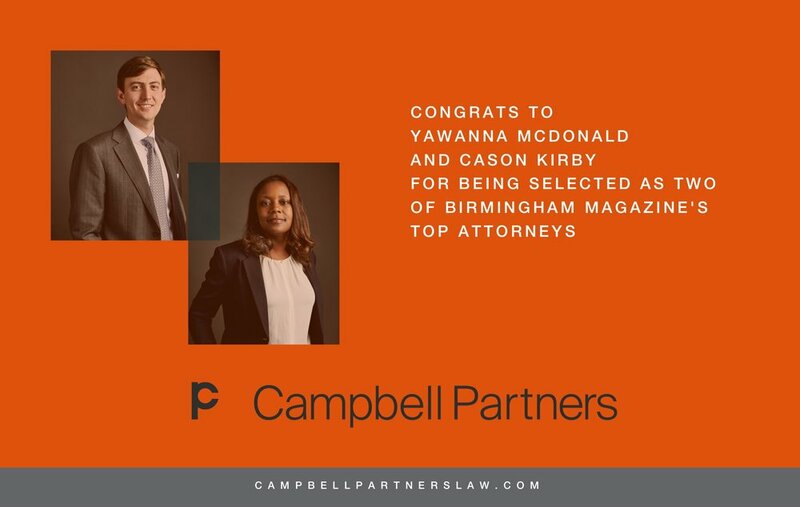 Two Campbell Partners lawyers have been named 2019 “Top Attorneys” by Birmingham magazine. Partners Yawanna McDonald and Cason Kirby received this recognition from the local publication. At Campbell Partners Yawanna McDonald focuses on Business Torts, Corporate Litigation, and Trial areas. Further, Yawanna’s representation includes trust and estate litigation, probate and estate administration, and other general litigation matters representing both plaintiffs and defendants. Cason Kirby’s practice focuses on representing privately-held companies and individuals in all types of business disputes, including securities litigation, corporate fraud, shareholder disputes, and enforcement of corporate officer non-compete agreements. Through his practice, Cason counsels businesses and individuals on meeting their changing needs throughout each step in the litigation and appeals process.